Today is the 68th anniversary of the founding of the Food and Agriculture Organization of the United Nations (FAO) in 1945. Many organizations such as the World Food Program have observed October 16 as the World Food Day since 1981. The World Food Day theme is "Sustainable Food Systems for Food Security and Nutrition" in 2013. 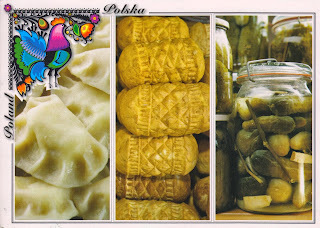 Postcard PL-496296 from Poland shows a variety of traditional food in Poland. It reminds us the food security and agricultural development is a global concern. Collaborative actions are needed in the struggle against hunger, malnutrition and poverty. For more information, visit World Food Day USA.